I have a low deck across the front of my house with 2″ x 6″ x 4′ deck boards perpendicular to the house, resting on the 4″ edge of 2 redwood beams about 14″ high and 22′ long. When I removed some of the deck boards, I noticed the lower edge of the siding (texture 1-11) was rotted in a couple of places. I removed all the loose stuff. What is the best way of repairing damaged siding and protecting the wood from further decay? The problem areas don’t show when the deck boards are in place and the rot totals maybe 12-15 square inches. A few inches of the wood sheathing behind the siding is gone, too, so I need some kind of backing if I used a filler of some sort. The redwood beams restrict access to the damage since the one closest to the house is about 6″ from it. Thank you for any suggestions. Because of the close proximity of the deck support beam it limits the options for repairing the damaged siding. If I am visualizing your situation accurately, repairing the damaged siding with bondo filler is one of the easiest ways to proceed provided the repair area in not too large. Use Bondo Wood Filler instead of regular body filler as it is thicker and will not sag out of the hole as much while curing. This post about repairing woodpecker damage will give you some insight about how to effect the repair, and this link to a Vinyl Column repair slideshow will provide a good visual reference to how the repair should be made. 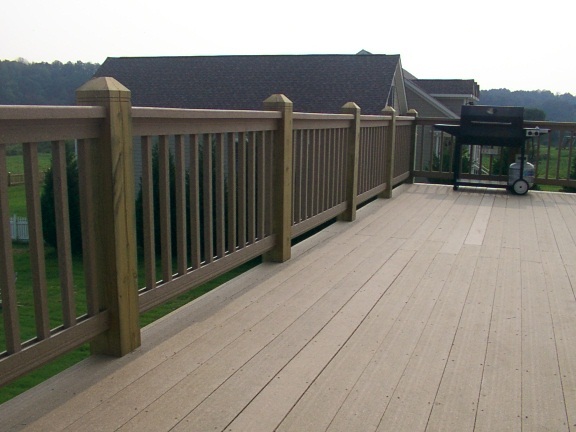 For a long term solution to prevent the problem from recurring the wall area below the deck should be properly flashed to prevent moisture from intruding into the space behind the deck. This is best achieved by first removing the deck boards in the entire area that requires flashing. There are several methods that can then be employed to flash the area. Please review this drawing for some ideas on one possible solution. Thank you for taking the time to respond in such detail. I investigated the wood filler you recommended for repairing the damaged siding and contacted the manufacturer with a couple of questions. They said the filler is a medium brown color, which would show through the semitransparent stain on the siding. Also, the filler has no wood preservative properties, a concern of mine. If you know of another high quality product that would address one or both of these issues, that would be very helpful. 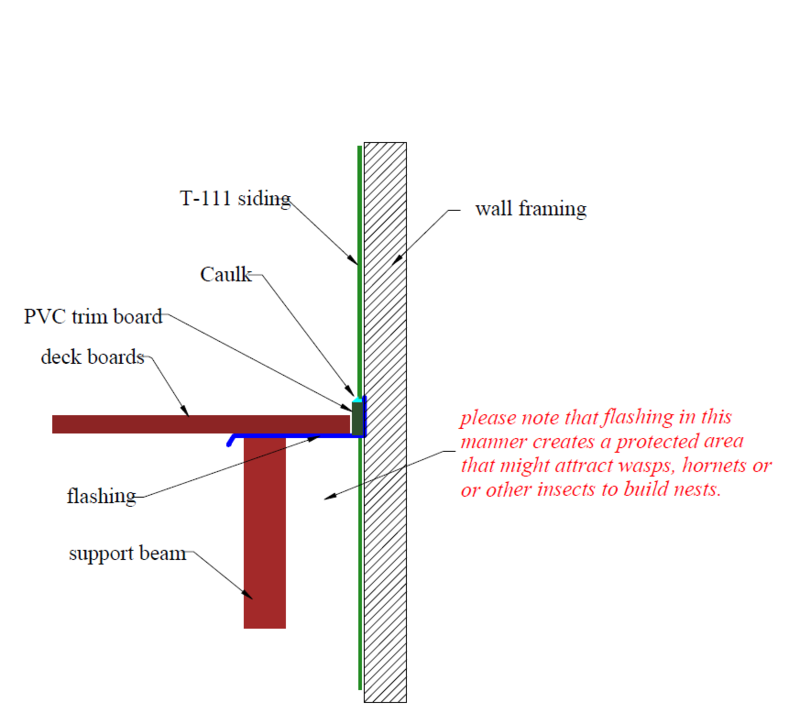 The flashing detail you provided was interesting, although I wonder how it would look to use horizontal PVC trim boards below the T 1-11 fir siding which has vertical grooves, especially with caulk along the top of the board. The siding itself extends only 3″ or so below the deck overlapping the top of the cement block foundation. If I’m looking at the detail correctly, it seems that the siding would be cut off about 2″ above the surface of the deck (to accommodate that board). That would effectively remove all of the damaged siding (and then some). I also wonder whether or not there should be space between the edge of the deck boards and the house or if the boards should fit snugly against it. If you know of any other flashing method that might work well in this situation, please let me know. Thank you again for your willingness to “discuss” this with me. I’m sure you’re very busy and this is not an emergency. You are very welcome. I am fortunate in that I enjoy my work and helping people find solutions for their home maintenance problems. I incorrectly visualized the area in question. As you can see from the drawing, for some reason, I envisioned the siding extending much farther below the level of the deck than your description indicates. The fact that the siding only extends a few inches below the level of the deck floor allows for a different and easier solution than previously suggested. First I would like to go over a few points about the bondo filler that may clarify whether it is suitable repairing your damaged siding. You indicated that the manufacturer said it had no wood preservative properties and I am sure that is true. The product itself, however, will not decay nor will insects ingest or otherwise damage it. It is also water proof and freeze proof. Repairs made using the methods I described may easily last for ten or more years and often quiet a bit longer than that. The wood adjacent to and surrounding the repaired area is no more or less vulnerable to decay or insect damage than it already was. The reason repaired areas sometimes fail, resulting in the wood adjacent to the repair continuing to decay, is because a crack formed where the bondo and wood meet allowing water to infiltrate and saturate the wood. Bondo is a pretty stable product not prone to excessive expansion or contraction from changes in temperature or humidity. Wood however is more susceptible to these environmental changes. This is why it is critical to properly prepare the area to be repaired. All damaged or soft wood should be removed. If there is any question about the soundness of any remaining wood, the use of a wood hardener such as Minwax wood hardener is recommended. The wood around the edges of the area to be repaired should be undercut and nails or screws should be positioned, in the central area to be repaired, in such a manner as to allow the bondo to lock onto the nail or screw heads. This will minimize movement between the dissimilar materials as well as the chances of water intruding into cracks that might otherwise develop in improperly executed repairs. As you have already correctly surmised, neither the color nor texture of the bondo will match the surrounding wood. Additionally because cured bondo is so impermeable, it does not take stain well and it is almost impossible to make it match any wood stained with semi-transparent stain. It is better suited for applications where paint or solid color stains will be utilized. Unfortunately I know of no other product that I could confidently recommend for repairing damaged siding. Now for what is hopefully a better approach to the flashing issue; I suggest making a horizontal saw cut in the siding at or slightly above the level of the finished deck floor that is high enough to clear the damaged areas of siding. Now a piece of aluminum coil stock, such as is used in the vinyl siding industry, can be bent with a 90 degree lip that will slip into the groove allowing the wider portion to lay flat against the siding and extend down to a half inch or so below the bottom edge of the siding. The flashing should be fastened with enough stainless steel trim nails to hold it securely in place and caulked into the saw groove with a good exterior grade caulking color matched to the stained siding. The flashing may be purchased in a near match or complementary color or painted the same. I feel the deck floor boards will have to be removed to properly fasten, caulk and paint the flashing. When they are replaced they may either fit snugly against the flashing or if debris accumulation is a concern a small gap is acceptable. If desired, prior to installing the flashing, the damaged area of siding can be repaired with bondo or a new piece of siding can be nailed into the area. The repair will not have to look all that great or be sealed all that well as it will be hidden behind the flashing. I have thus far focused on repairing the damaged siding because that is what you asked about. However, if the siding only extends a few inches below the top of the deck, replacing the entire piece of siding may actually be an easier and better solution. I hope I have been of some service in helping you deal with this issue. If you have any further questions I will be happy to try and answer them. This entry was posted in Exterior Maintenance, Questions and Answers, Siding and tagged damaged wood, repairs, T-111 siding, wood rot. Bookmark the permalink.